Hi everyone - I need a new exhaust for my scooter. It's an Li150 engine bored out to 175 and Stage 2 tune by MRB. I'm running an SH1/20 carb. Has anyone got any recommendations for a good cheap(ish) Clubman. 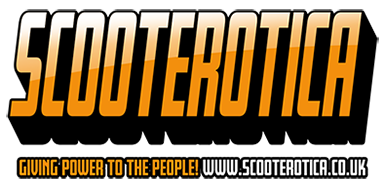 I've looked at the KBA and the AF Rayspeed, also the Scootopia. Also, would I be better getting a bigger carb? No and no. There's very little to gain using a Clubman. To be honest I'd fit a standard GP exhaust and stick with the 20mm carb. It's a perfect setup. Upgrading won't add anything and you'll find it's just as fast. Very true. I tried a clubman on my LI150S (stilll 150) and all it did was make it noisier. Does anyone think or is there any evidence that using a clubman on a basically standard carb and cylinder may actually make performance worse? ^... all depends if the gearing suits. A clubman will push the power higher up the rev range than a standard pipe and if your motor cannot rev sufficiently on the gearing then it will lose bottom end and gain nothing at the top. However, if the hearing is short enough to reach the revs then it may well perform considerably better. e.g. put one on a standard TV200 and you'll certainly not pull correctly in 4th, put one on an SX/Jet 200 and you're in 50/50% chance of pulling top, however put one on a standard GP200 and you'll probably find it performs better under most conditions. This is main the result of the 4.4, 4.8 and 5.2 4th ratios and allowing the revs to reach where the clubman shifts the power and over-rev to. 'Standard'... can be quite different from one model to another. Adam's right. A clubman, being a larger pipe, will allow more gas to pass through. Hence you have to rev more to fill the volume. But if you're limited by your particular gearbox it might not happen. Reason I mention it is that I put a clubman on my Lince 200 when I built it because I had one in the shed and the standard exhaust that was on it looked a little worse for wear, whereas the clubman was unused. The gearing is standard SX 4.8, carb is SH2/22 (again because it was there). I'm getting about 55mph flat out on GPS, though it pulls from 30 on OK in top. That sounds about right. I don't think they do add a lot to top speed anyway. Maybe they rev a little more. But you still hit the wall at about 55 MPH. Well, that's my experience anyway. Others may say different. interesting thread. I bought a AF Clubman for my new small block rebuild 200 kit and had trouble starting and running issues . I swopped the engine to a 185cc and there has been a big improvement but its very noisy. I am thinking of trying my old original standard LI box on it to see if starting and running improves. I am not looking for outright top speed improvement so I'm thinking the considerable extra noise of the 42mm clubman is just a nuisance .